Are you looking for an exciting and comprehensive Italian language programme? Do you want to study abroad in Italy and learn Italian? You have found what you are looking for! For those who want to study abroad in Florence, Milan, Rome or Siena, we offer you the chance to learn Italian while learning the Italian culture and way of living. The Italian language schools in Italy "Leonardo da Vinci" offers you many resources to choose your Italian language course. We offer a variety of high quality Italian language, art, cultural courses (and much more) for beginners up to Italian language teachers all year round. The Scuola Leonardo da Vinci, officially authorized by the Italian Ministry of Education, was founded in Florence in 1977 and boasts 30 years of experience as institute specialized in the field of Italian teaching. During the following years several school's branches opened in Milan, Rome and Siena. Our Italian language Schools are recognized by many national and international institutions such as: CSN Lund, 9 German Federal States for "Bildungsurlaub" and many US Universities for Academic credits. Variety of students from over 50 countries come to study abroad in our Scuola Leonardo da Vinci Italian language schools. All our language schools are located in the historical centers of the most beautiful and important cities of Italy: Florence, Milan, Rome and Siena. Want more? 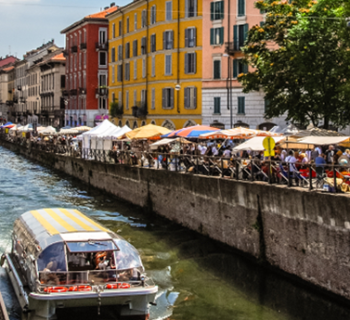 Take part in one of our Italian language programs in Italy! Our courses start every 2 weeks at all levels and you can stay as long as you want. At our language school in Siena you may start your course every Monday, if you are not a beginner. Not enough? Visit our website and ask for a free brochure. Why a blog? Discover it by reading our Welcome Message! E’ arrivato Ferragosto! Voi come lo festeggiate?